Let’s Hear it for Browny! Another great moment for CrossFit Sioux Falls. This past weekend Michael Brownfield attended the CrossFit Level 1 Certification in Golden, CO. I know I can speak for everyone in CrossFit Sioux Falls by saying how proud we are of you Browny for this great accomplishment. You raise each and everyone’s athletic and personal game to a higher level at CrossFit Sioux Falls. Your intensity, encouragement and character is such a positive influence on all of us. CrossFitters, show Mike B some love in the comments. Michael, here’s to a Great 2010! Thanks for all you do brother. 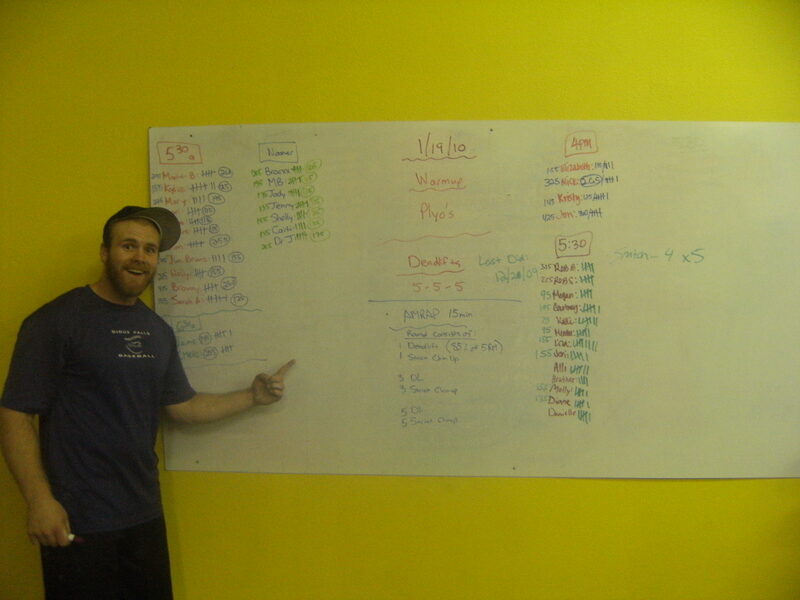 This entry was posted on January 19, 2010 at 5:53 pm and is filed under Crossfit Philosophy, In the News, Members. You can follow any responses to this entry through the RSS 2.0 feed. You can leave a response, or trackback from your own site. Nice job! Way to raise the bar! Heck ya dude! Congrats and get ready to live that vision board!! Congrats!! And Great Job Mike!!! Way to go Mike! Definitely well deserved! Great Job Michael!! I’m so proud of you! GREAT job Mike!! You’ve come a long way from when I use to bike next to you in Spinning class, and I couldn’t be prouder! Congrats Mike – big plans in your future – I can feel it!! Great work Mike – Congrats!!! So proud of you — what an inspiration you are to so many! Great job! Awesome job, Mike!! Congrats and way to be on the path to making your dreams come true!! Thank you all for the kind comments! This is just one more example of the awesome community that we have at CFSF. I am truly blessed to have such great friends. The certification was an amazing experience with some of the best CF athletes in the world. They were so easy to visit with and they are willing to share their knowledge and expertise. If anyone is considering attending a certification, please do so…it’s so worth it in my opinion. The last segment of the discussion was on programming at affiliate locations. Chris Spealler led the forum and offered some advice on creating constantly varied, functional movements performed at high intensity. We are very fortunate at our box because Chris, Annie, and the staff do exactly what was recommended to have a successful atmosphere. The most notable thing I took from the weekend was that CrossFit makes you better at life. That’s what we have available to us…from the Paleoholics group that focuses on nutrition to the OLY classes which specialize on the most challenging lifts and now with CrossFit Kids starting recently to bring up the next generation of Firebreathers. All aspects of becoming the person and athlete you want to be are at our fingertips. The opportunities are right in front of us. Thanks again to my CFSF family. 3-2-1…you know the drill! !